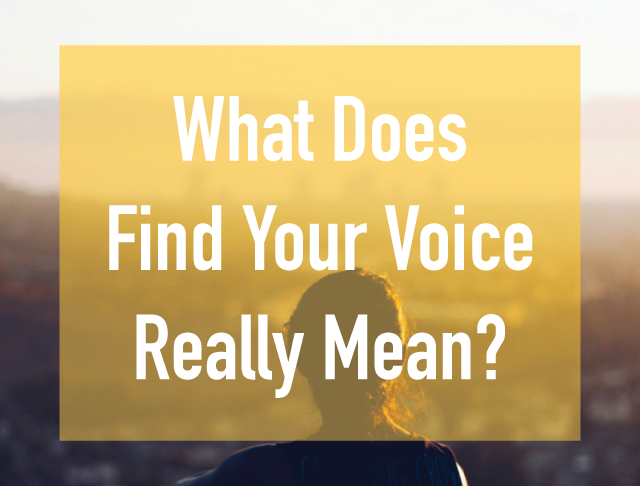 What Does Find Your Voice Really Mean? No one really explained its definition to me, and I was too embarrassed to ask. Yet, it was pretty clear to me that “voice” was referring to the personality of the publication. And with that knowledge, I was able to take on and off different “voices” depending on who I was writing for in order to stay consistent with the particular publication. That’s what pro writers do. Ok, find your voice. There are tons of articles out there that tell us to do this. Yet none of them tell you exactly what “find your voice” means. Honestly, I think the author of the article doesn’t tell us because she, herself, doesn’t really know. Which leaves you, my friend, left trying to figure out the meaning of that elusive guidance. That guessing and worrying crap ends today. Allow me to break down “voice” for you. Every established publication has a voice. The voice of Cosmo is young, while the voice of Town & Country is sophisticated. Do any of you remember the site DailyCandy?. (Rest in peace, DC!) Their voice was the voice of your sassy, intelligent BFF. Their editors (I was one of them!) did such a great job of adapting that voice across the platform, that tons of people tried to copy its tone. That’s the sign of a strong voice. Next time you read your favorite pub or blog, describe the tone in three words. That’s the voice! Everyone has a voice. If you communicate, you have a voice. Even my dog who speaks mainly in whines and yelps, has a voice. When people tell us to find our voice, it makes it seem like we didn’t have one to begin with. You have one. You just have to decide what you want your voice to be when you write. My writing voice is an elevated version of who I am in person. If you sit down with me at a coffee shop, you’ll find that I ramble more than I do in my writing and I’m a little more laid back. I’m also not inspiring and put-together all the time. Why? Because when we write, it’s like we’re on stage. We’re at our best. We know we’re here to entertain, educate and inspire. So while you always want to remain true to who you are, you also want to respect that people want an elevated version of yourself. Take a part of your personality and step it up a notch. The reason people tell us to find a voice is because people want friends with personality. No one wants a friend who on Monday is perky and on Tuesday us sarcastic. We don’t want those types of friends because we want to know what to expect from that person. We also fall in love with the idiosyncrasies of our friends, and we can only find those if our friend is consistently who she is. The same is true for your writing. You want to pick a voice and be consistent with it, so your readers know what to expect from you. My favorite example of a strong and consistent voice is that of my dear friend, Maria Tettamanti of The Wordy Girl. Maria often refers to herself as zany. In real life she is, but not every single second of the day. She’s also serious, kind, and intelligent. But she’s decided to take this one part of her real-life personality and elevate it to make an impactful brand. The best way to establish your voice is to read other strong voices. I also recommend copying those voices as an exercise. Try to write like them. When I was doing a lot of fashion and beauty writing I would try to emulate the voice of The Cut. It was snarky, and I wasn’t, so it was fun to put that on. Once you try on other voices, you’ll understand the difference between a strong voice and a weak voice. Next, you want to write like you speak, but as if you were speaking clearly and with confidence. What would you sound like if you were always clear? If always knew what your intention was? What would sound like if you were confident in your writing? That’s your writing voice. Practice that voice every day — even if you never publish the work. Eventually, it will become second nature to you. 5. What if You’re a Media Company and Not a Person? If you’re a media company, you get to choose who you want to be. So fun! Most importantly, you want to create a personality that would vibe with the people you’re speaking to. If you’re writing for college students, you don’t want your voice to sound like a mom, right? You want to create a voice that these students would want to hang around with. Make a choice. Make the personality real. And stick to it.